All transactions are secure and handled by PayPal. Only PayPal will see your credit card number. All of your information will be kept absolutly private. We will never sell or share your information. The next session of classes start soon. Our classes are small. Register early to ensure that you get the class of your choice. Classes are only $97 per session. The Spanish Books are required for the classes. They are available on Amazon as an eBook or hard copy. 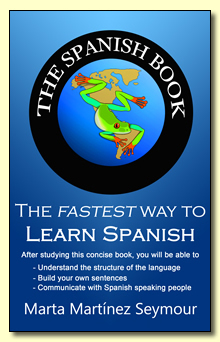 The Spanish Book Level 1 is required for Spanish 1 A, B, and C.
The Spanish Book Level 2 is required for Spanish 2 A, B, and C.
You can now order your copy of The Spanish Book Level 1 and The Spanish Book Level 2, the eBook version of the textbooks that were used for many years at The Spanish Class Cafe. Now, also available in hard copy. Register early. Our classes are small and spaces are limited. This site was built by Panwebs.